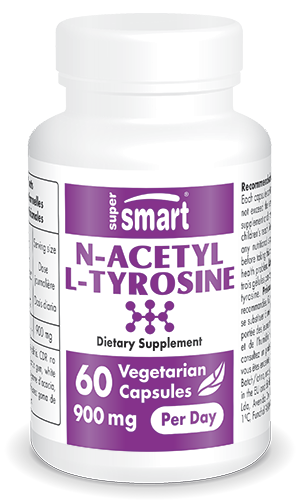 N-acetyl l-tyrosine is the fastest-absorbed and most bioavailable form of the amino acid l-tyrosine, converted into two essential neuro-mediators: dopamine, which helps create a sense of well-being, and noradrenalin (or norepinephrine), the natural brain stimulant. Each vegetarian capsule contains 300 mg pharmaceutical grade N-acetyl L-tyrosine. Take one to three vegicaps a day on an empty stomach. To facilitate the conversion of tyrosine into neuro-mediators we also recommend taking a multivitamin with vitamin C, vitamin B6 and folic acid.